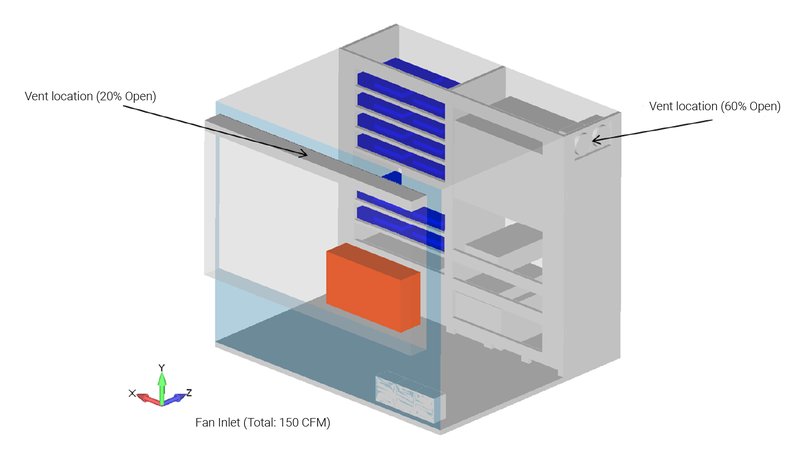 Due to tight temperature requirements, a CFD study was done on a chamber that is used for the automatic handling and thermal conditioning of biological samples. The key driver for this work was the client requirement to have the biological sample trays be within a two degree temperature range during processing. Figure 1 shows the starting point for the CFD simulation. The CAD geometry was de-featured and simplified for the model. The air flow within the oven was driven by natural convection due to several power supplies within the oven and two large fans at the bottom of the case. One of the key requests from the client was to minimize the use of fans and to maintain a laminar flow through the cabinet. Our prior CFD consulting work allows us to leverage past “lessons learned” and to quickly develop optimized air flows. 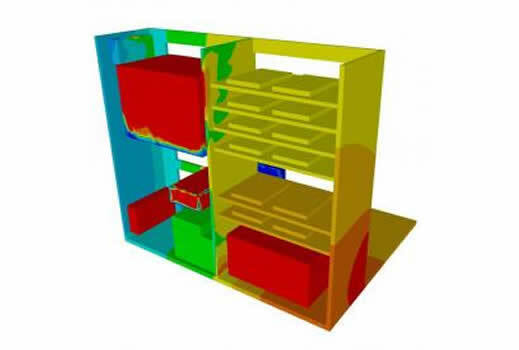 CFD Results from this study were used to optimize the vent locations and provide the final design layout. Subsequent thermal tests by the client showed that the enclosure met the two degree temperature specification with margin. The CFD predictions on this sub-component were especially important to the client due to the high-value of the biological samples within this sub-section of the chamber. It was also especially good to see that these CFD results were validated by subsequent experimental work by the end-user.